Atlantic recording artist Portugal. The Man has announced a major North American headline tour. The dates get underway at a special intimate performance on May 20th at New York City’s Irving Plaza and then continue through a July 18th homecoming concert at Portland, Oregon’s Crystal Ballroom (see attached itinerary). In addition, Portugal. The Man will follow their recent performances at the Coachella Valley Music & Arts Festival by appearing at a number of other summer festivals, including the inaugural Boston Calling Music Festival (on May 25th), The Governor’s Ball Music Festival on New York City’s Randall’s Island (slated for Sunday, June 9th) and Manchester, Tennessee’s Bonnaroo Music & Arts Festival (June 13th – 16th). 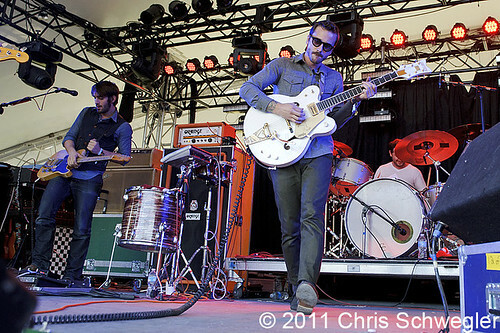 For complete details and tour information, please visit www.portugaltheman.com/tour-dates. On June 4th, Portugal. The Man will release their new album, “EVIL FRIENDS.” The collection – produced by five-time GRAMMY® Award winner Danger Mouse (Gnarls Barkley, The Black Keys, Sparklehorse) – arrives in stores and at all online retailers on June 4th. The album will be available for pre-order via the band’s site, www.portugaltheman.com, on April 30. Last week, the band debuted a new album track, “Purple Yellow Red and Blue,” which can be heard now at P.TM’s official YouTube channel, www.youtube.com/portugalthemanband. Yesterday, Fader.com premiered the video (watch at http://atlr.ec/Zi2iwa), directed by That Go (Noel Paul & Stefan Moore), known for their work with Bat For Lashes, Royksopp, and Thunderheist. After premiering last week, the song is already in rotation at several modern rock stations across the country, including Los Angeles’s KCRW, Seattle’s KNDD, Milwaukee’s MLUM, Kansas City’s KRBZ, and the band’s hometown rock station, Portland’s KNRK. “Purple Yellow Red and Blue” is available now at all DSPs. Portugal. The Man will celebrate the release of “EVIL FRIENDS” with an appearance on NBC’s Late Night with Jimmy Fallon on June 5th. In addition, the band’s performance on last night’s episode of ABC’s Jimmy Kimmel Live! can be viewed now at http://beta.abc.go.com/shows/jimmy-kimmel-live/video/PL5520977/_m_VD55298979. “EVIL FRIENDS” – which follows 2011’s acclaimed “IN THE MOUNTAIN IN THE CLOUD” – sees Portugal. The Man pushing their distinctive brand of modern psychedelia to extraordinary new heights. With Danger Mouse at the helm, the Portland, Oregon-based band has created a collection that truly captures the remarkable scope and power of frontman John Gourley’s vision. For further news and information, please visit www.portugaltheman.com, www.facebook.com/portugaltheman, and twitter.com/portugaltheman, and http://youtube.com/portugalthemanband.